Over 80 clinicians gathered to share best practices around caring for women and newborns impacted by substance use, especially opiods. Left to Right: Dr. Gerald Zarlengo Chairman & Ceo COPIC, Jaime Cabrera executive director cpcqc, jade woodard executive director illuminate colorado, jose Esquibel director office of community engagement for colorado attorney general’s office, dr. susan hwang physician champion chosen collaborative & neonatologist children’s hospital colorado. 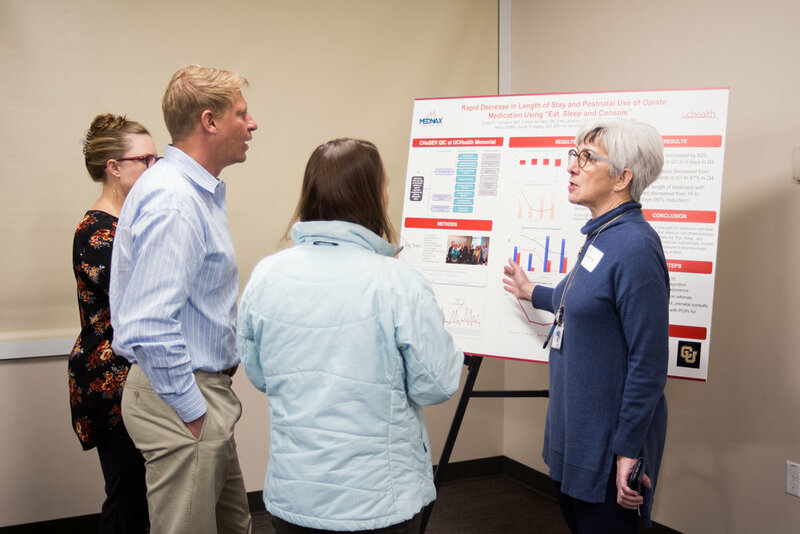 DENVER, COLORADO (January 31, 2019) — Over eighty clinicians from NICUs and Mom and Baby Units and partners from around the state gathered at the Colorado Hospital Substance Exposed Newborns (CHoSEN) Collaborative Winter Forum in Denver on Thursday to share best practices around caring for women and newborns impacted by substance use, especially opioids. The CHoSEN Collaborative is supported by the COPIC Foundation and the Colorado Office of the Attorney General and includes sixteen Colorado birthing hospitals already committed to a set of practice changes as part of a statewide quality improvement initiative. The project is a partnership between the Section of Neonatology, Department of Pediatrics, University of Colorado School of Medicine; the Colorado Perinatal Care Quality Collaborative (CPCQC); Illuminate Colorado; and the Colorado Substance Exposed Newborns (SEN) Steering Committee. “We have the opportunity as providers not only to improve our practice while engaging families in the care team but also to improve measurable outcomes for newborns and families impacted by substance use during pregnancy,” said Dr. Susan Hwang, the physician champion of the CHoSEN Collaborative and neonatologist at Children’s Hospital Colorado and University Hospital. Hwang went on to share preliminary results of the CHoSEN Collaborative’s aggregate data demonstrating a drastic decrease in length of hospital stays for opioid-exposed newborns and an increase in prenatal counseling and service referrals for families. “This is just the beginning of how we can improve the experience of opioid-exposed newborns and their families in our state,” said Hwang. 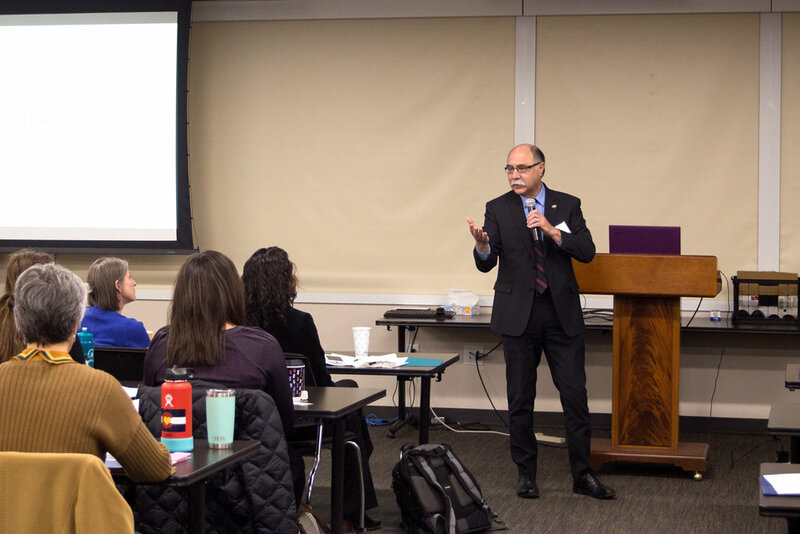 “We know from experience that collaborative action is most effective in achieving healthier outcomes for moms and babies,” shared Jaime Cabrera, executive director of the Colorado Perinatal Care Quality Collaborative (CPCQC). CPCQC is a statewide nonprofit network of hospitals, healthcare facilities, clinicians and public health professionals that improves the health of women and infants through continuous quality improvement. José Esquibel, Director of the Office of Community Engagement for the Colorado Attorney General’s Office delivers opening remarks. Jade woodard, Executive director of illuminate colorado welcomes attendees to the inaugual illuminate colorado leadership awards ceremony. VAIL, COLORADO (September 26, 2018) — At the 2018 Strengthening Colorado Families and Communities Conference, three Coloradans and one Colorado-based foundation received awards for their work strengthening Colorado families. Awardees include: Colorado Attorney General Cynthia Coffman, Colorado State Representative Dafna Michaelson Jenet, Marc Winokur of the Colorado State University School of Social Work, and the Zoma Foundation. The biannual conference sponsored by the Colorado Department of Human Services and attended by more than 600 professionals across multiple disciplines, explored new strategies and innovative ideas for family strengthening and support. Illuminate Colorado, a statewide organization dedicated to building brighter childhoods through education, advocacy, and family support and the nonprofit responsible for organizing the conference, presented the awards. “It is my honor to work with and recognize some of Colorado’s most effective leaders in the community” said Jade Woodard, executive director for Illuminate Colorado. “Today presents an opportunity to build on the accomplishments of previous Colorado leaders, celebrate the sector’s courage and innovation, and catalyze the field,” said Woodard. With a research-based approach that emphasizes building Protective Factors in families, Illuminate Colorado works to address systemic and multi-sector issues affecting the wellbeing of children and families, collaborating with partners at the state and national level to develop powerful programs, policies, and initiatives that prevent child maltreatment and strengthen families. The Courageous Leadership Award recognizes a Colorado public official for distinguished service focused on the prevention of child maltreatment and strengthening families. Representative Michaelson Jenet, unable to be present at the ceremony, was recognized with the Courageous Leadership Award for her determination in advocating for children and family issues in the Colorado Legislature including her sponsorship of House Bill 18-1064 to increase access to child sexual abuse prevention education for early childhood professionals. For a video of the full ceremony, visit https://www.facebook.com/CO4Kids/videos/422214188307002/. Illuminate Executive Director, Jade woodard, shares the legacy of commander lori moriarty. Tiffany perrin, senior program officer representing the zoma foundation, receives the catalytic leadership award on behalf of the foundation’s investments in colorado. Awardee Attorney general cynthia coffman poses with Illuminate’s executive director jade woodard. Tiffany Perrin on behalf of the zoma foundation poses with Illuminate’s executive director jade woodard. Attorney General Coffman, the First recipient of the lori moriarty leadership award, poses with Lori’s family and jade woodard. Marc Winokur, director of the colorado state university’s social work research center, addresses attendees after receiving the innovative leadership award..
Awardee Marc Winokur poses with Illuminate’s executive director jade woodard. Colorado State Representative Dafna Michaelson Jenet Accepting The Courageous Leadership Award from Illuminate’s Lobbyist Andi Leopoldus.